American Express Company (the “Company”) is hereby furnishing below delinquency and write-off statistics for the U.S. Consumer Card Member lending portfolio of its Global Consumer Services Group operating segment and the U.S. Small Business Card Member lending portfolio of its Global Commercial Services operating segment for the months ended January 31, 2019 and December 31 and November 30, 2018. The statistics presented above provide information that is additional to the data reported by the American Express Credit Account Master Trust (the “Lending Trust”) in its monthly Form 10-D report filed with the Securities and Exchange Commission. 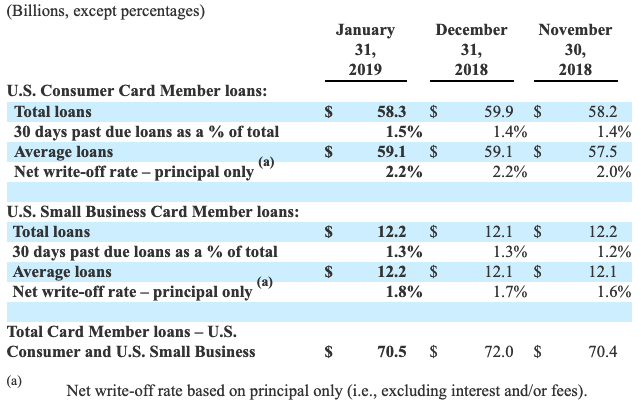 The Card Member loans that have been securitized through the Lending Trust do not possess identical characteristics with those of the total U.S. Consumer or U.S. Small Business Card Member loan portfolios, which include securitized and non-securitized Card Member loans. The reported credit performance of the Lending Trust may, on a month-to-month basis, be better or worse as a result of, among other things, differences in the mix, vintage and aging of loans, the use of end-of-period principal loan balances to calculate write-off statistics in the Lending Trust compared to the use of average loan balances over the reporting period used in the statistics of the U.S. Consumer and U.S. Small Business Card Member loan portfolios, as well as other mechanics of the calculation for the Lending Trust net write-off rate, which is impacted by any additions to the Lending Trust within a particular period. Set forth below is certain information regarding the credit performance of the Lending Trust for its three most recent monthly reporting periods, as reported in its Form 10-D report filed with respect to each such period.